Hi friends! 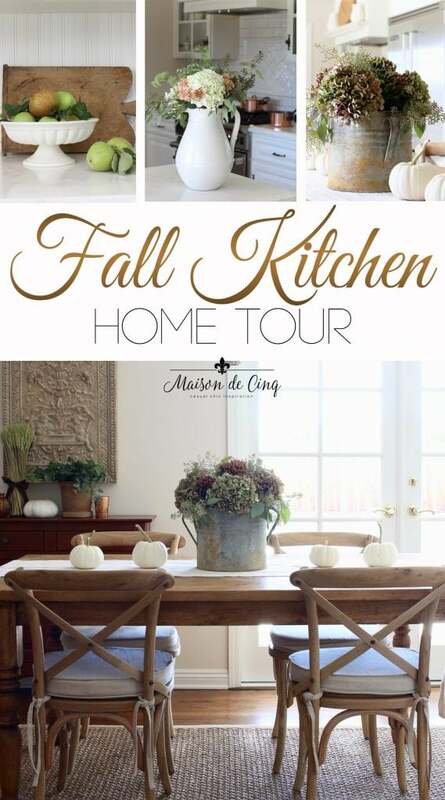 It’s been busy here at Maison de Cinq as I’m sharing my second fall tour in a week! I’m thrilled to be a part of the Seasonal Simplicity Fall Tour, hosted by Krista from The Happy Housie. Today I’m joining seven other bloggers and we’re all sharing our fall tours, with over 35 total sharing during this week. 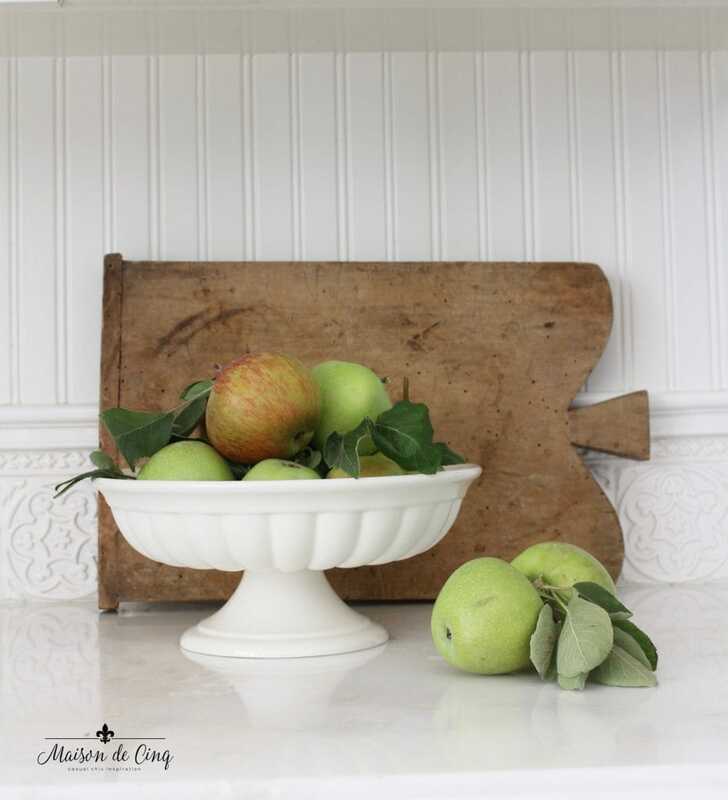 If you’re coming to me from Deeply Southern Home and are new to my blog, welcome! Be sure to scroll down to the end of the post to see all the inspiration! 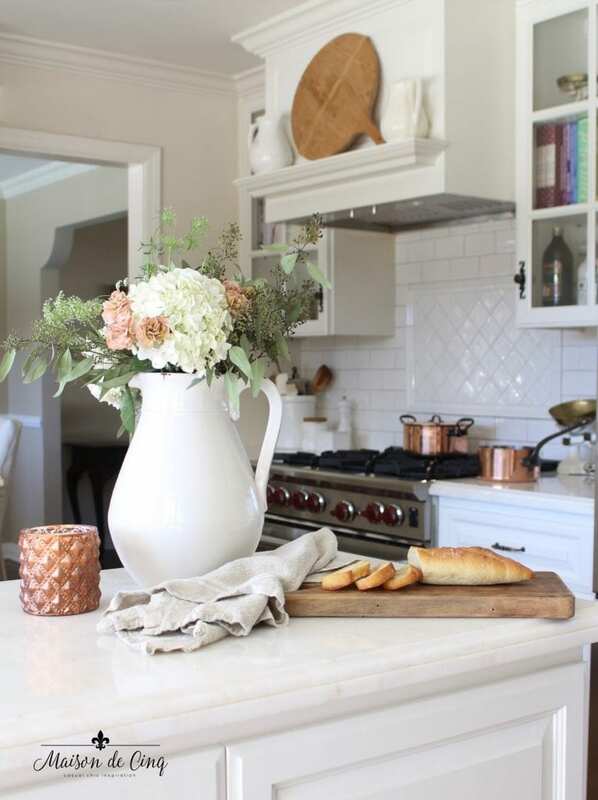 Today I’m continuing my cozy, coppery feel that I shared in my family room yesterday, and this time I’m sharing my fall kitchen tour. I’m loving these fall colors this year! I don’t know if it’s because I did a more neutral palette the last couple of years, but their warmth is really speaking to me right now. 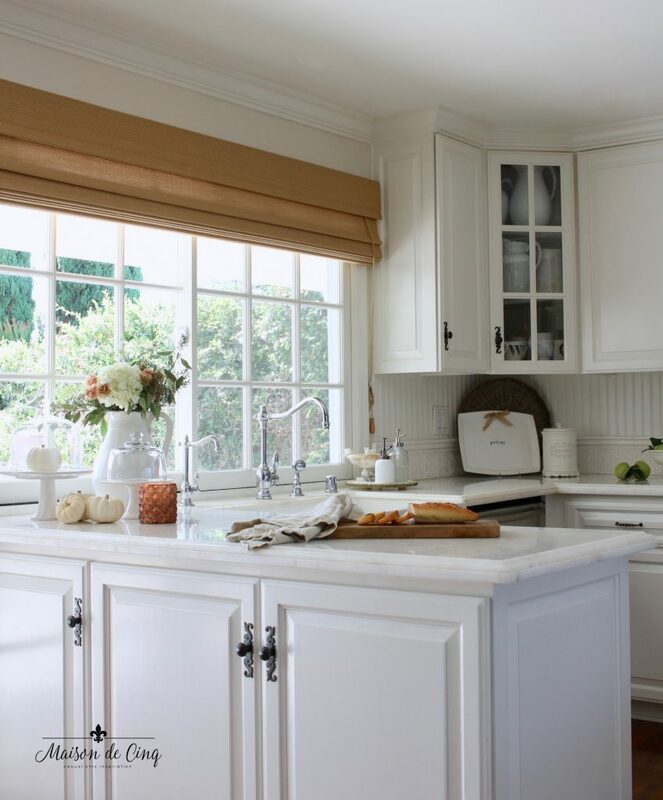 I love styling this area of the kitchen. I keep some cake plates here year round, and when different seasons or holidays roll around I add a little something to them. Though I love them empty, too! My copper pots are something I started buying a couple of years ago. I use them year round, but I do love displaying them in the fall. They add such warmth to the space. 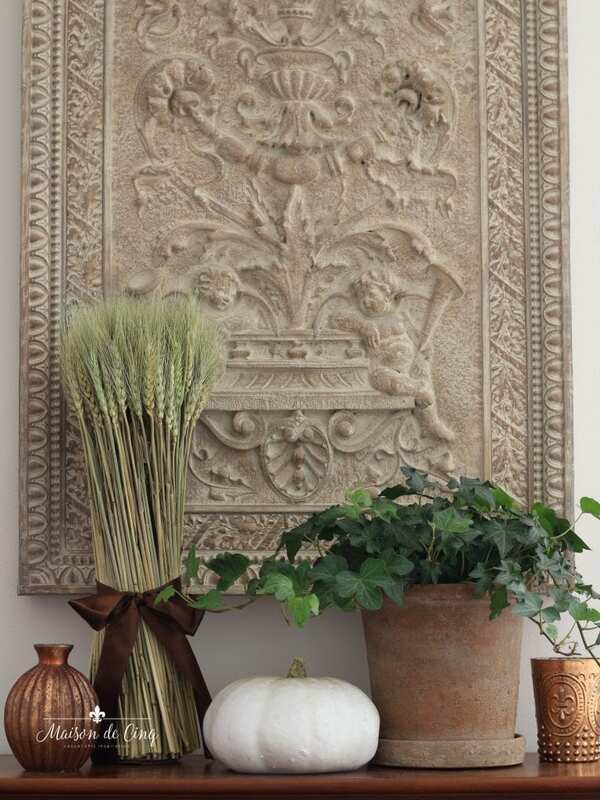 A sheaf of wheat, some copper votives and a white pumpkin form a little fall vignette on the console table in the breakfast area. These antique hydrangeas are one of my absolute favorite flowers, and they are so representative of fall. I love their rich but faded colors – the exact thing I was going for this year! In fact, I had them in my head when I was planning my fall decor this year. Here I clumped them in a vintage French zinc bucket, along with a couple other flowers and my go-to eucalyptus. The runner is an antique grain sack. 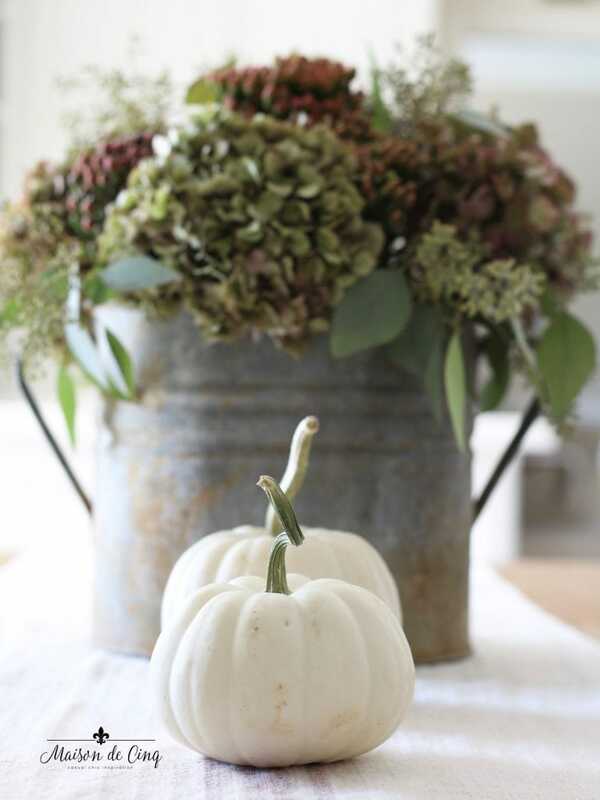 White pumpkins are always a good thing don’t you think? 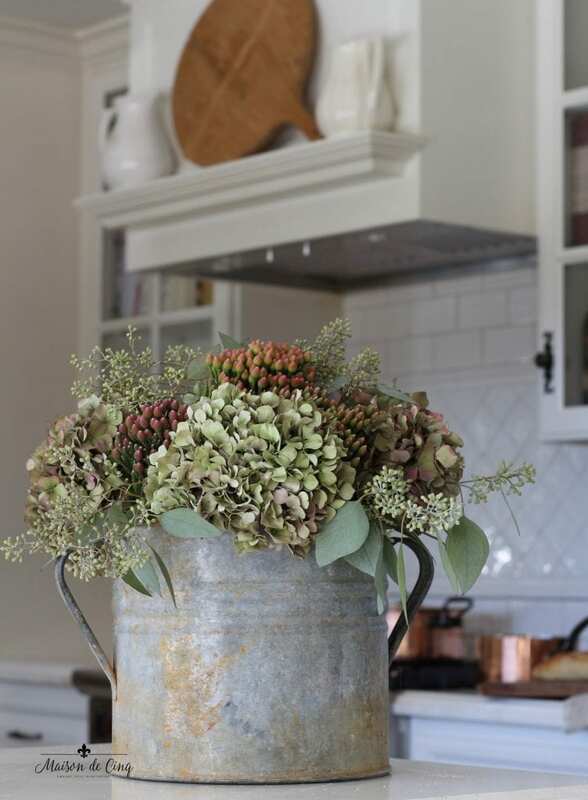 Those hydrangeas in that zinc bucket have my heart. Swoon! Such a beautiful kitchen! I love the table centerpiece especially! Shelia, your home is beautiful year round, and I especially love it for Fall! So warm and inviting! Aww thank you Shelley! That’s so sweet of you to say. And thank you for coming over to the blog, it really means a lot! Aww thanks Summer! So fun to be “hopping” with you again my friend! 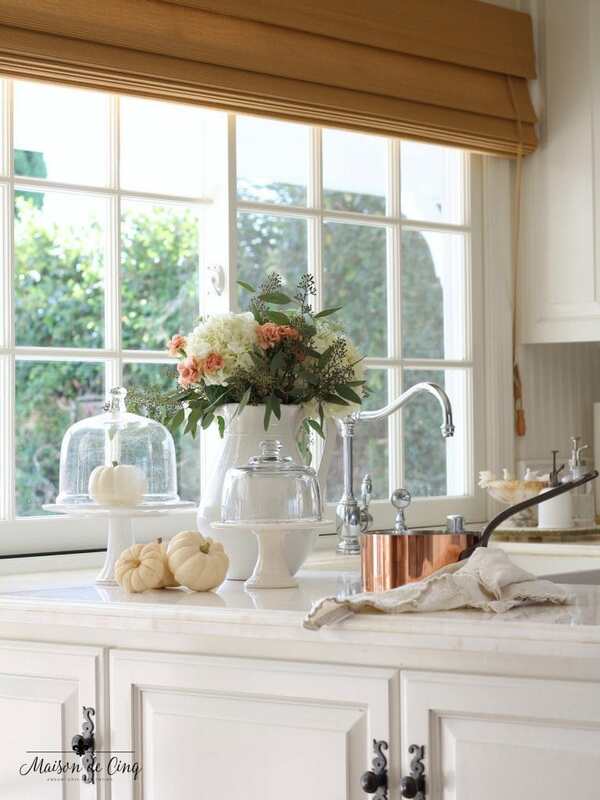 White pumpkins are always a good idea and I love your use of copper. I may have a bit of a obsession myself. Beautiful fall touches! Thanks so much Krista! I so appreciate your kind words, and you having me as part of your tour! Your ideas are delightful! 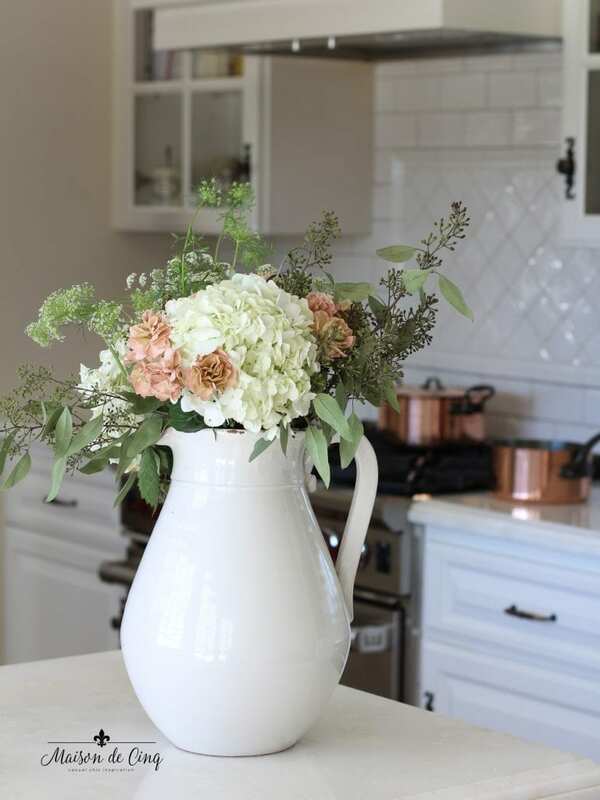 I especially liked the floral arrangement in the beautiful white pitcher! 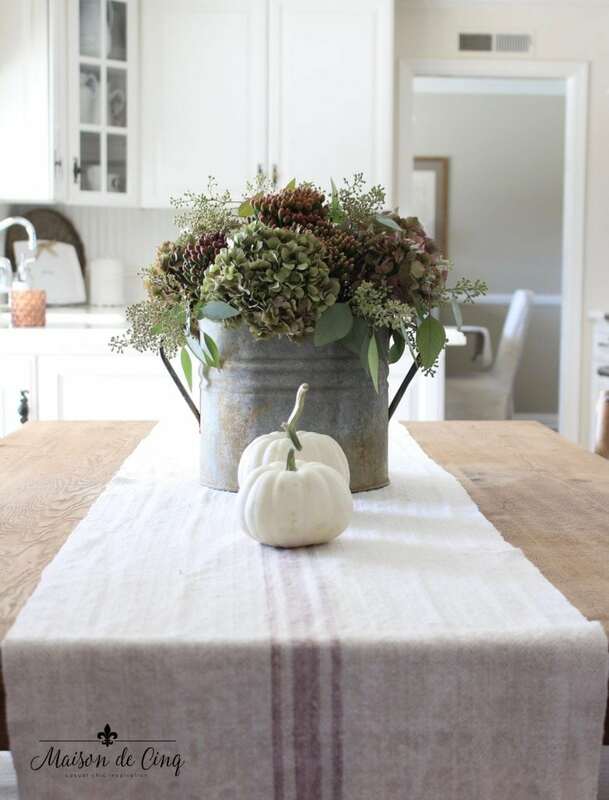 I saved quite a few of your lovely fall creations on my Pinterest Autumn Table Decoations board! Thanks for posting a blog so entertaining and helpful! Looks so very nice! I love hydrangeas too. I always love when I see your cherub plaque above the console table in the breakfast area, is it available to purchase somewhere? Would love to have one. Thanks so much for your kind words Candy! And the plaque is quite old. I bought it at Home Goods about 10 years ago, and I’ve never seen it again. Sorry I couldn’t be of more help.